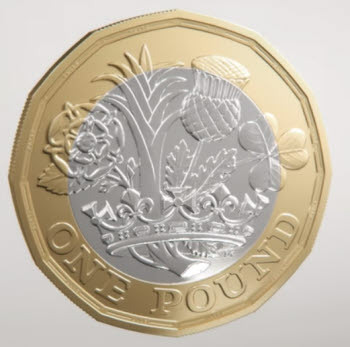 Following in the wake of the new plastic £5 notes is the new 12-sided £1 coin for 2017. News of the new coin was first announced back in March 2014, now it is time for them to enter circulation. Here is how the design looks. That means it’s time to get your hands down the back of the sofa to dig out any coins that have fallen out of people’s pockets! Why? Because by the end of the year you won’t be able to use the old £1 coins. 1 What date does the new coin come out? 2 Is it worth keeping an old coin as a collectible? 3 What are the key features of the new quid? What date does the new coin come out? The 2017 £1 coin will enter circulation on March 28th. A 6-month period is allowed where both the old and new coins will be in circulation. Be sure to use that time to get rid of your old quids. If you have loads of them it may be easier to get yourself down to the bank and pay them into your account. Is it worth keeping an old coin as a collectible? Not really, to be honest. Unless it is an early round pound in beautiful condition there isn’t much point. You could keep one just for sentimental reasons, looking back in decades, when by then we may well be almost cashless with everything being digital! What are the key features of the new quid? There is a good video on the official Royal Mint channel showing off the coin and it’s security features. It will do a far better job than I possibly could. Watch it here. The months of April and July will see 2 new designs of the £2 coin released. One design will celebrate Jane Austen and the other will celebrate aviators of WW1. Thank you for checking out this news piece. You can subscribe or follow on social media to keep up with the latest news.